An example of manta rays in Hawaii. Off the coast of the Hawaii, unique forms of sea life teem beneath the waves. Its wide range of marine life make Hawaii a popular snorkeling and scuba diving location. However, one of the most exciting underwater creatures to see are the manta rays in Hawaii. Manta rays are giant eagle rays from the Manta genus. The word manta comes from the Portuguese word for cloak. This is because fishermen once used blankets or cloaks for catching rays. These creatures have long triangle-shaped pectoral fins spanning a reach of up to 20 feet or more. They are famous for their cephalic fins, shaped like horns. These have earned them the nickname of sea-devil, in spite of their gentle demeanor. Manta rays migrate through tropical waters. They swim with their mouths open to trap and swallow zooplankton for nourishment. They glide through the waters by gracefully waving their fins, traveling solo or in groups. Like whales, they can even leap out of the water. This can be a spectacular show for anyone fortunate to witness it. Manta rays are a vulnerable species, primarily due to pollution and poaching. Poachers harvest parts of their gills for use in Chinese medicines. Fortunately, the Convention on the Conservation of Migratory Species of Wild Animals agreement protects manta rays in international waters. 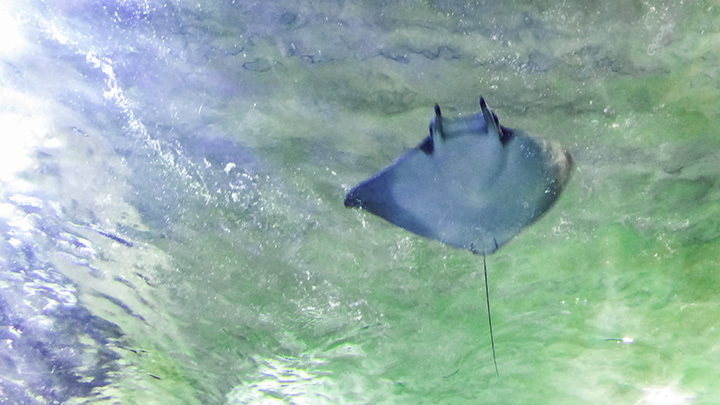 Sailors once revered the rays because of their horns, open mouths and sheer size of fins. All of which gave them an outwardly aggressive appearance. However, the manta rays are docile creatures that do not have deadly tail stingers, unlike the sting ray. The size of these mammoth mantas makes them very difficult to capture and showcase. As a result, very few aquariums have manta rays. So the best place to see one is in the wild. Hawaii is the ideal spot for marine life enthusiasts who want to see manta rays first hand. Here, one can dive with the rays or take a cruise where mantas most frequently swim. Unlike whale-watching excursions, manta ray sightings occur year round. So whenever you’re in Hawaii, a dive with manta rays will always be an option. Swimming with manta rays can be an unforgettable adventure. Some have even described it as one of the top ten best experiences a human can have. 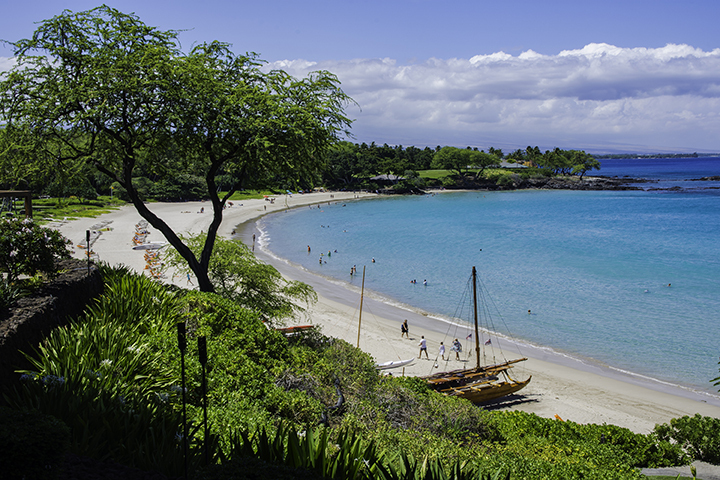 Mauna Kea Beach, where you can see manta rays in Hawaii. Visitors will have ample opportunities to dive with manta rays off the Big Island’s Kona coast. You can sail on a sunset cruise and learn about manta rays before going on a night dive. Experienced certified scuba divers can venture deep below the waves with the mantas. While others can snorkeling above these mysterious sea creatures. With the aid underwater lights, you’ll see mantas serenely swimming by, feeding on the zooplankton. This may be one of the best places to see manta rays in Hawaii. Also, resorts like the Sheraton Kona Resort & Spa at Keauhou Bay and Mauna Kea Beach Hotel offer night viewing locations for manta rays.